Ukraine will close airspace over the Black Sea in Kherson region for several days this week due to tests of intermediate-range missiles, spokesperson for the Ukrainian Air Force Dmytro Strutynsky said. 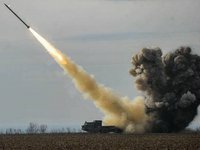 "The Ukrainian Air Force is starting flight tests of intermediate-range missiles for its air defense systems in Kherson region," Strutynsky told Interfax-Ukiraine on Wednesday evening. The tests will be carried out "during this week, until Sunday," presumably from November 1 through November 4, but an official statement on their beginning and the closure of airspace is to be made on Thursday, he said.